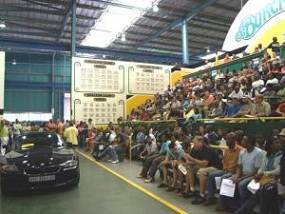 Standard Bank auctions selling repossessed cars for those looking to buy a pre-owned vehicle at a low price are usually handled by Burchmore’s and take place in Durban, Johannesburg, Cape Town and a few other areas around SA. For those who may never have been to one of these events the first thing you need to know is that you will have to pay a refundable deposit if you want to participate in the bidding. This deposit is usually in the region of R3 000 – R10 000 and will depend on the type of car you are bidding on. Deposits can be paid at the Standard Bank auctions for repossessed cars by bank guaranteed cheque or credit card, you cannot pay this with cash. After paying your deposit you will receive a bidding number which you can use to bid on the pre-owned car you wish to purchase. If your bid is a successful one, a handling fee will then be required which may vary slightly but at the time of writing this feature, the fee cost is R1 200 plus VAT at Burchmore’s auction house. Remember too, VAT will be added to your bidding price and another fee not to be overlooked is a registration fee of around R100 – R350. The car’s registration fee will be your responsibility although some auctioneers will offer to register the vehicle on your behalf which you will then have to remunerate. It is a good idea, if you need vehicle finance, to have everything in place before you start bidding at an auction because the full balance has to be paid within 24 to 48 working hours after close. If for any reason you cannot come up with the money within this time you will lose your deposit. Find out the prices of secondhand cars at local car dealers in your area and get an idea of the price the specific make and models that you are interested in are going for. Follow that rule every time you attend the auctions selling repossed cars and you are half way to picking up a bargain. Take note of the following reasons why you may choose Standard Bank when looking for a vehicle. Standard Bank has been around for many years and, for a long time, they have been obliged to repossess a range of different items. They chose to do this via auction and they made the decision to run their own. Thus, Standard Bank has many years of experience in selling assets and items via auctions. They have a dedicated team of staff specially trained to handle the sale of repossessed items and to handle auctions. Because Standard Bank is so popular and well-known, they are the financial service provider of choice to finance homes, cars and other assets. Because of the sheer majority of people who choose Standard Bank when they need credit, Standard Bank is often obliged to repossess vehicles and other assets. Because they have to repossess so often, Standard Bank has a very large range of items that they sell. These items vary in age, make, model, condition and price. Standard Bank has many repossed vehicles that must be sold on in order to make back the money that they lost when their debtor did not pay up in full, on time or at all. Because of this, they are focused on getting rid of their repo cars as quickly as possible. Thus, Standard Bank charges affordable prices for vehicles that would be very expensive anywhere else. You can rest assured that at a Standard Bank auction, you are sure to save money. Because Standard Bank is such a reliable and versatile financial service provider, they offer customers the option of financing as well as a large range of other financial services when they shop at Bank car auctions. A vast amount of South Africans use them as their bank and apply for loans, vehicle financing, credit cards, bank accounts and investments through them. Standard Bank has competitive deals and options and they always aim to offer customers great benefits. They are incredibly competitive in the industry and always try to go the extra mile. What other companies/financial service providers offer auctions? There are a number of reputable, well-known auctioneering houses who offer good deals on great quality items at auctions. However, there are also many auctioneering houses that are known for being dishonest and selling assets and items above what they are worth or lying to potential buyers about flaws and faults. Most financial service providers are obliged to repossess vehicles and other assets and some of them hold their own auctions to sell their goods. However, most of them hand their repossessed goods over to an auctioneering house to sell on for them.